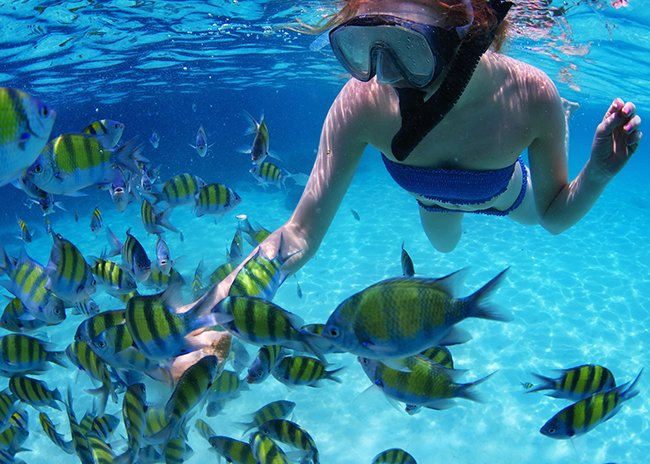 Discover The Forbidden Location Where You'll Enjoy An Exclusive Snorkeling Experience In Cozumel! …that teems with the richest possible variety of marine life – both brilliantly colored marine plants and tropical fish. And, imagine being able to enjoy this amazing spectacle, without even getting wet (if you choose) because everything is visible within a few feet through the glass at the bottom of your boat. We've gone on Snorkeling Tours before - But never enjoyed such a High Level of Personal Service"
Make sure to book your snorkel adventure with these guys! I can't tell you how much we were taken care of from the time we stepped out of the transportation until the time we departed! We obviously were experienced snorkelers that had gone on snorkel tours but we never the same personal customer service and we were very thankful for that! We went to 3 different locations with our guide Alberto and Captain Santiago. I can't say enough about these guys! They are awesome and if you get a chance to be able to request these guys please do they will take great care of you and you will have a awesome experience with them! I wouldn't book a trip with anyone else in Cozumel! Make sure to book with them! And tell Alberto and Captain Santiago, we said hello! You’ll be astonished at the sheer volume and variety of the colorful tropical fish swimming among the impressive reefs of both hard and soft coral (we actually feed the fish to encourage them to stay in the reefs). If you’re really lucky, you might enjoy a glimpse of a clawless lobster, turtles or a graceful ray with its graceful wave-like motion. 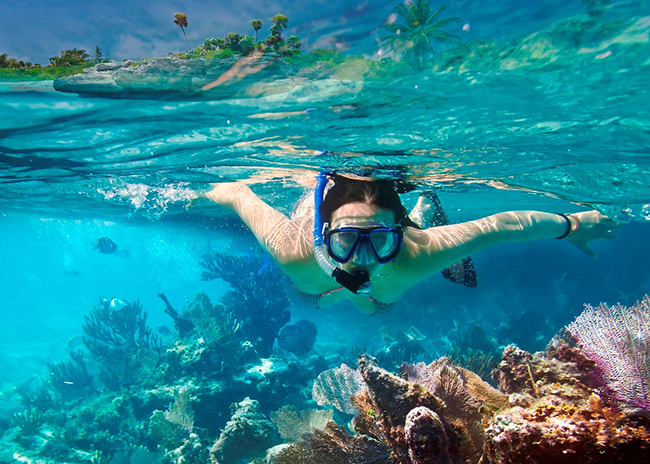 The most spectacular reefs in the area lie within the protected Cozumel Marine Park area. But, because we are one of the very few businesses who have invested in the high quality glass-bottomed boats, with the latest environmentally friendly engines, to meet the very strict ecological requirements needed to preserve this marine wonderland, you will enjoy a spectacular trip of a lifetime with us. 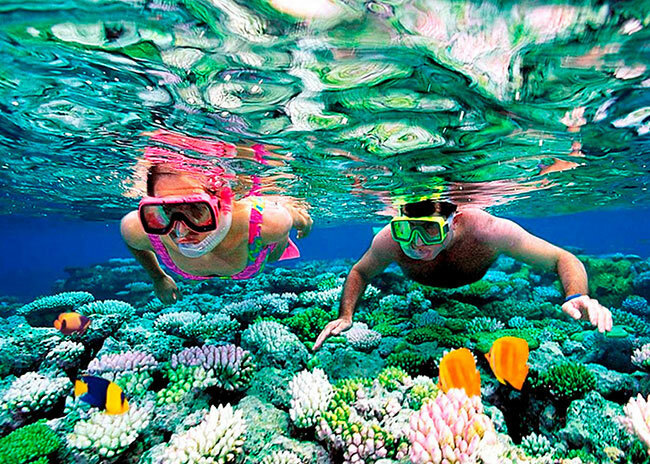 YOU'll visit a total of 3 Snorkeling Reefs. Which – needless to say – are 3 of the most astonishing among a whole area of spectacular reefs. The reef packs with sea fans, brain corals, star corals, gorgonians, and sponges. 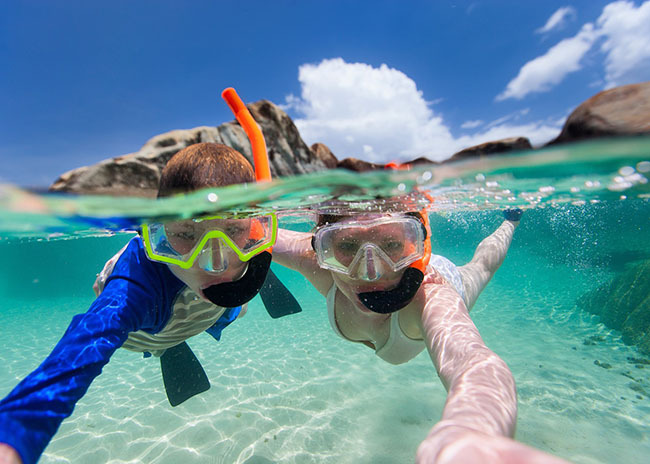 If you are planning on using your GoPro camera while you are on this snorkeling tour, you can rest assured that you will take some fantastic photos and videos. Generally speaking, this is a shallow reef which is perfect for novice snorkelers. Which is no less beautiful. Both reefs are a mix of hard and soft coral, each type of coral having its own indigenous marine plant life. Villa Blanca Reef Cozumel is one of the ideal places for snorkeling, diving and swimming in Cozumel. This reef has everything that a modern snorkeler, regardless of his or her experience, needs. 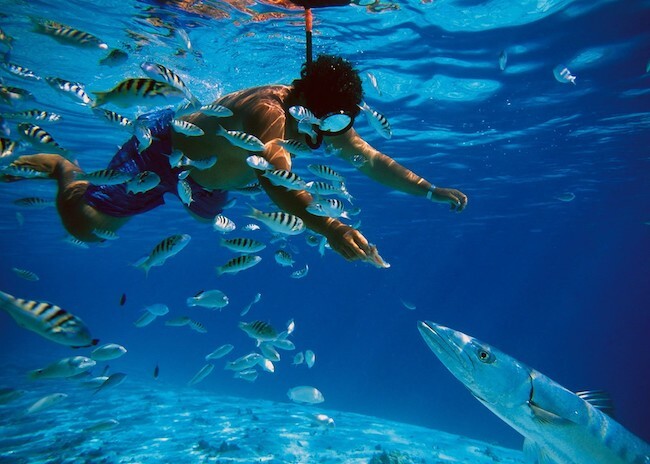 There is abundant marine life, the place is not very shallow, but not very deep either, there are organized tours to this place, and there are some attractions around that you can enjoy too; this is the reason why severe snorkelers highly recommend Villa Blanca Reef. That means ‘Royal Water’ in the ancient Mayan language. There are many stunning corals and unique fish in abundance. It is easy to get carried away and stay here for hours. Even though it's not guaranteed, you can see some turtles too. This was the Best Reef I have ever experienced in the three years I've been to Mexico"
Booking this excursion was quick and easy, we booked the Cozumel Snorkeling Tour which was 3 stops at different shallow Reefs. I must say this was the best Reef I have ever experienced in the three years I've been to Mexico. We saw so many awesome fish and I have no idea what the names of any of them are! Fernando was awesome about getting us included in some photos. All the boat Captains and Snorkeling Guides (mostly my uncles and cousins) are certified snorkeling guides with at least eight year’s experience and Speak excellent English, so your memorable day won’t be spoilt by having to struggle to understand what they are saying. Because – in situations like this, when safety has to be top priority – it’s vital you understand every word the instant your crew says it, without a second’s doubt or hesitation. Over the years we have thrilled many thousands of snorkelers with the sheer excitement of the experience we provide and many become firm friends and return again and again to snorkel in our beautiful coral reef – second only to the Great Barrier Reef in Australia. Hola … my name is Alberto Novelo and I and my close family have been providing snorkeling tours in Cozumel for 23 years (since 1995). So, when you take our tour you’ll know you are dealing with a family owned and staffed business, because we will look after you far more attentively than a business staffed by mere employees. And it’s important for you to know that – whether I or my brother, Jorge or my cousin, Sandy is your Snorkeling Guide, you are being served by one of the owners of the business – not merely a disinterested employee. So if you can’t swim (or simply don’t want to get wet) you will still enjoy the glorious sights in the crystal clear tropical waters below the boat from the comfort of your seat, shaded from the sun, with a cold drink at your elbow. 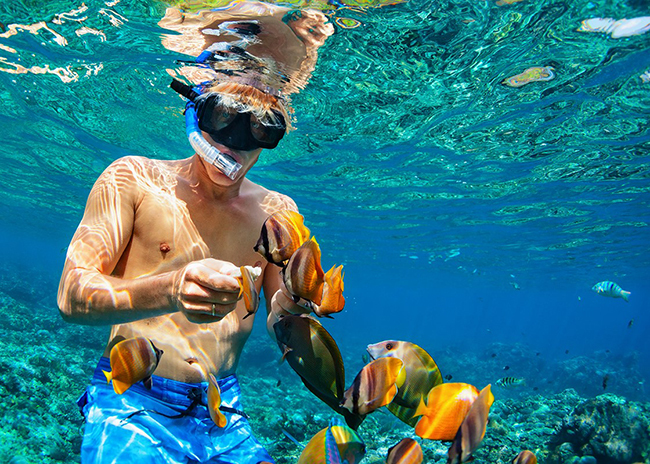 And if you are planning on snorkeling, then, during the short trip to the reefs, our guide will demonstrate exactly how to use the snorkeling equipment and how to snorkel for maximum comfort and safety. More than a Snorkeling Adventure - Friendly Personalized Tour"
We have had two great tours with Alberto. Everything was well arranged, from the booking through the website to the snorkel gear. Snorkeling on the reefs and with the turtles was lots of fun. Alberto is a professional tour guide, who knows the spots to see the most amazing sea life and is able to tell everything about them. We had such a great time the whole tour! It was full of adventures and excitement, but easy and relaxing at the same time, thanks to Alberto! It was a nice mix of activities and the perfect amount of time for us. He took fantastic pictures during the whole trip. We came home with them so we can relive it anytime we want to! It really was the best part of our whole trip! 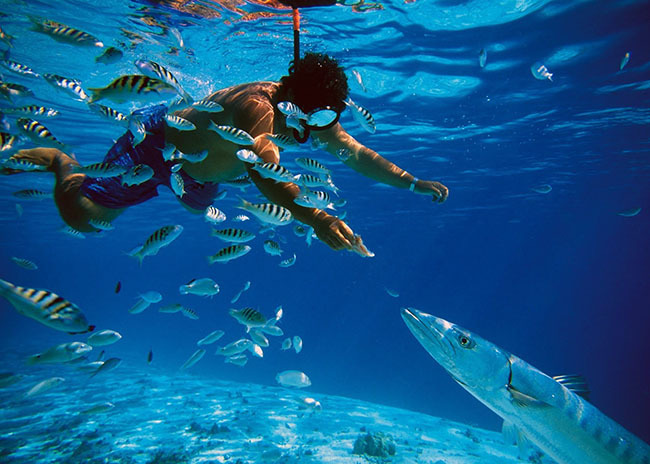 We would highly recommend to book a tour with Cozumel snorkeling Tours when you are in the Island! Alberto, thanks again for a Great Experience! Absolutely no overcrowding – ever! So determined are we to ensure you enjoy the best possible experience on this wonderful day, we strictly limit our 22 person capacity boats to a maximum of 10 or 12 passengers. This means we can give each and every one of you the sort of personal attention you deserve as our valued guests, particularly if this is your first time swimming underwater. We saw boats with 20 people. 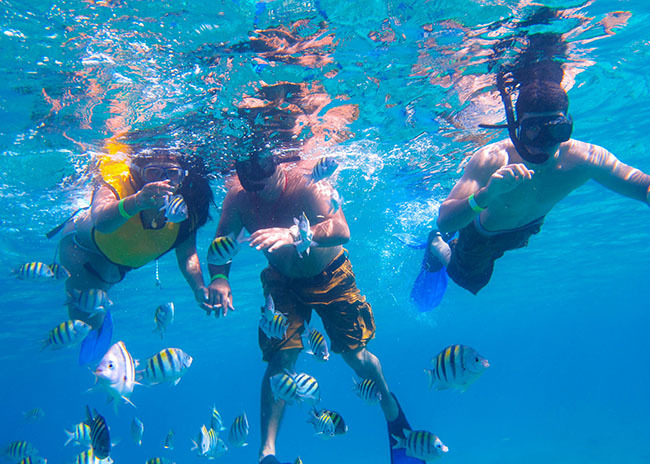 That many Snorkeling in a small area wouldn't be the Best Experience Ever"
Based on reviews, we booked our tours with Cozumel Snorkeling Tours before leaving the States. In addition to having a great personality and very proud of his country, he's a wealth of information on the area and the sea life. Both tours were excellent, we spent about 40-45 minutes on each one of the 3 Reefs. We saw eels, barracudas, lobster, conch and all your typical reef dwelling fish. In both cases, we were just a small group and on the first day it was just the 6 of us. It made for a much better snorkeling experience. We were passed by boats with as many as 20 people on them. That many people snorkeling in a small area wouldn't be the best experience. 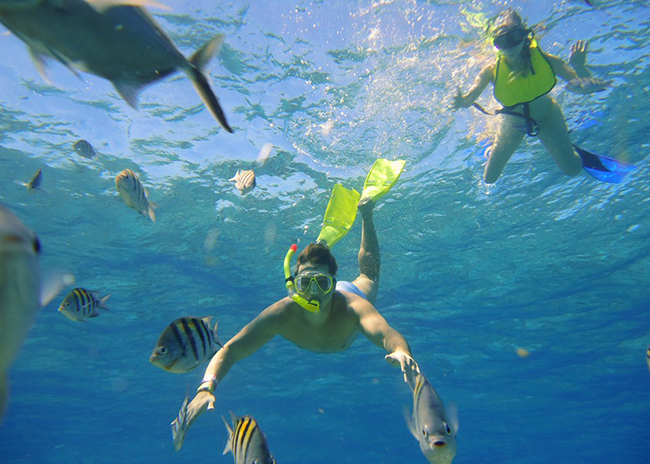 We were very happy that we booked in advance with Cozumel Snorkeling Tours. Because I’ll be delighted to give you a FREE upgrade to a totally private boat trip where you’ll enjoy all the facilities and comforts of our standard PREMIUM boats – with the added benefit that you won’t be sharing your boat with anyone else. You can also choose to start your trip at your desired time rather than the regular start times we have thru the day. There is no extra charge for this – you simply have to select this option when making your booking. What sets us apart from other Snorkeling tours in Cozumel? My company is one of very few that fulfills the very strict ecological demands by operating ultra eco-friendly glass-bottomed boats and are thus licensed to enter the restricted rich marine life protected area forming Cozumel’s spectacular underwater wonderland – The Cozumel Marine Park. Our glass-bottomed boats are all equipped with ample shade and plenty of comfortable seating. So if you can’t swim (or simply don’t want to snorkel) you can still enjoy the glorious sights in the shallow, crystal clear tropical waters below the boat from the comfort of your seat, shaded from the sun, with a cold drink at your elbow. We are a family owned business and all of our Guides & Captains are family members. This means we are far more motivated to make your day wonderful in a way no employee could ever be. All our Staff speak fluent English and we hold an American English certificate ‘Test of English as a Foreign Language’. While other Snorkeling tour companies will charge you to supply a cooler with water, you can enjoy our unique ‘Welcome Pack’ on board our Boats with Beers, Softdrinks, and Bottles of Purified Water completely free of charge. You see, despite our boats being licensed to carry up to 22 guests, your comfort and enjoyment comes first, so we rarely take more than 12 passengers on a trip. That means you have the room to spread yourself on the boat and we can give you a really personal service. 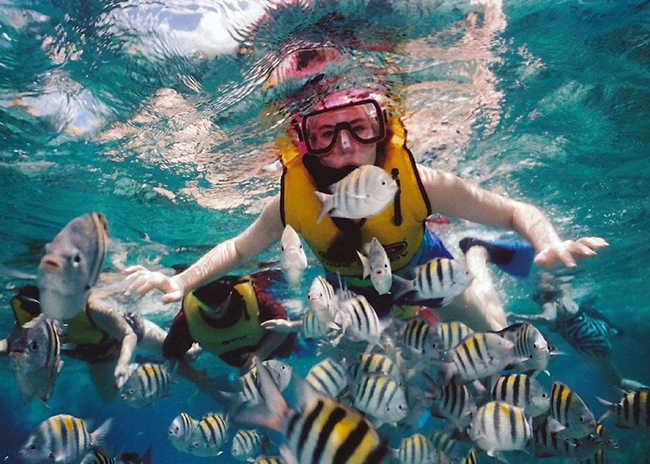 Even if this is your First Time Snorkeling, YOU will enjoy an Exceptional Experience that few other tours can match! And if you are planning on snorkeling for the first time, our English speaking guide will demonstrate exactly how to use the snorkeling equipment and how to snorkel for maximum comfort and safety, during the short trip to the reefs. Unlike many snorkeling companies operating out of Cozumel, we supply a brand new snorkel tube, free of charge, for your exclusive use. So you can be confident that you – AND ONLY YOU – will have had this tube in your mouth. After your trip we carefully dispose of every tube in a totally eco-friendly way. The shallow reefs were Amazing! 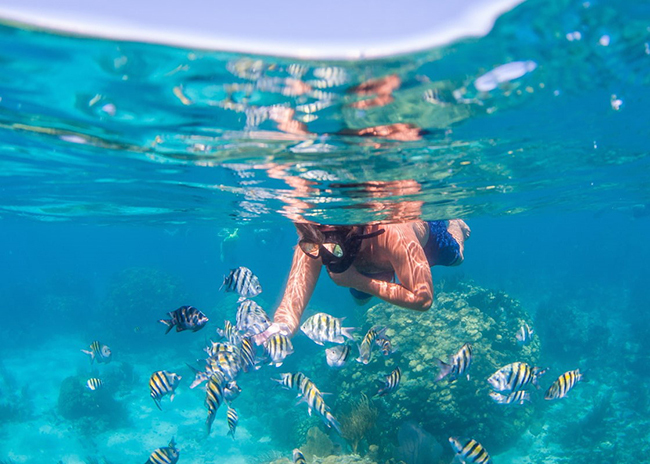 - Can't believe the amount of fish we saw"
My partner and I had no snorkelling experience and after reading numerous reviews decided to book our first snorkel with Cozumel Snorkeling Tours! We arrived and were given equipment and a little talk about our trip then practice in shallow water which was good. We were in a small group with 2 other couples, Captain Santiago and Guide Alberto, so only 8 people in total and never felt crowded, was perfect size. The Shallow Reefs were amazing and couldn't believe the amount of fish we saw. This may be because we were beginners and have no other experience but we were amazed!! Saw many turtles and even a huge one which they said was rare to see! Then back to our Cruise Ship. Really good morning trip and would thoroughly recommend for any beginners! Coming in on a Cruise Ship? You’ll arrive at the Cruise Pier, which is just across the street from our meeting point (about 100 yards from both Puerta Maya, and TMM International Cruise Piers). If you are staying in Cozumel: Everyone - including the staff at the hotel you’re staying at – knows where the ‘Marti Sports’ (the ‘Sporting Goods Store’ next door to Hard Rock Cafe) is and will happily give you directions. Or you can just hop in a taxi, because all the taxi drivers know the way! Coming from Playa del Carmen? Perfect, because you’ll arrive at the Cozumel Ferry Pier, which is just a few minutes away from our meeting point by taxi (and all the taxi drivers know where the ‘Marti Sports’ is). We meet at 9:30am, 11:00am, 12:00pm (noon), 1:00pm, or 3:00pm and the Tour lasts approximately 2 ½ hours. Meeting up could not be easier and if you are one of the 80% of our VIP clients who come off a cruise ship, you’ll find our meeting place just 50 yards from the Cruise Pier right across the road at the Marti Sporting Goods Store. And, if you are coming by ferry from Playa del Carmen, our meeting point at the Marti Sporting Goods Store is just a mile away along the shoreline. You’ll find taxis right outside the ferry arrival point that will quickly transport you to our meeting point. And, if you are staying in a hotel on Cozumel, you’ll received ample directions with the emailed confirmation of your booking. And every taxi driver knows where the Marti Sporting Goods Store is. Once you step aboard our beautiful glass bottom boat, you’ll be struck by how neatly organized everything is and much room you have. That’s because – even though our boats can carry up to 22 passengers in complete safety - we normally take no more than 10-12, so you can really enjoy the personal attention of our captain and snorkeling guides. 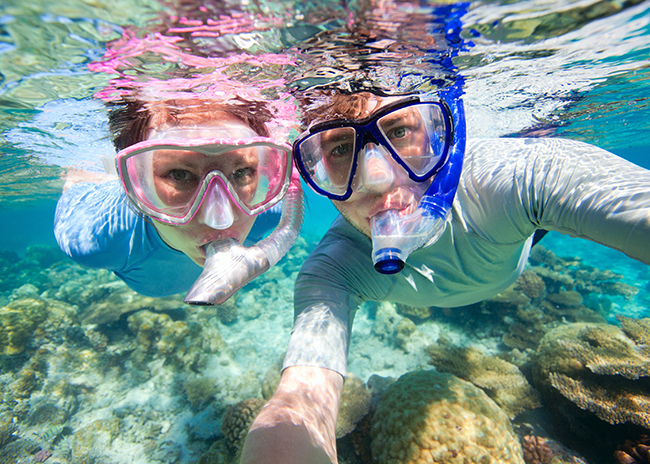 Your guide will explain how to use the snorkeling equipment and you’ll feel your excitement start to rise. Then, the magical moment arrives when you take your first dive! When you slip gently into the warm, crystal clear tropical water, you’ll enter a silent world of brilliant colors coupled with a wonderful feeling of weightlessness – just like flying. And – even if this is your first dive – you’ll feel totally confident because your experienced snorkeling guide will be close at hand in case you have any problems. The most spectacular reefs in the area lie within the protected Cozumel Marine Park area and thus out of reach to the majority of tourists who have to settle for a second best experience, because their tour operators are denied access to the ecologically sensitive are where the most beautiful reefs are located. So that strictly limits the amount and variety of marine life they see. (Unlike our boats) many tour boats (some of which might not even have a glass bottom) are jam-packed to full capacity, carrying 20 or more passengers. In addition, the crowded nature of the whole experience with all the unlicensed craft clustered around this limited area of second rate reefs outside the protected Marine Park, means it is very difficult to snorkel without bumping into other swimmers. What’s more, you simply do not get the sheer quantity and range of fish and other marine life you’ll find in the protected area of the Marine Park. 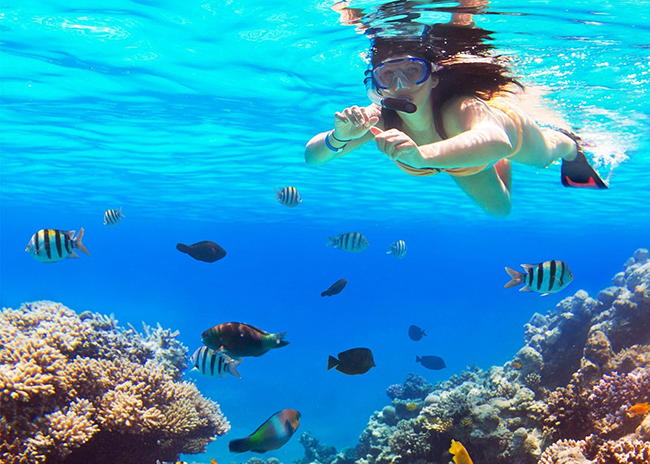 And, not only will you be enjoying the most stunning reefs of all, but you’ll find you are snorkeling with complete freedom – probably only having to share the reef with the 10 or 12 members of your own party. Which – needless to say –are three of the most astonishing among a whole area of astonishing reefs. The first of these are the aptly named ‘Paradise Reef’. Then we’ll visit the ‘Villablanca Gardens Reef’, which is no less beautiful. Both reefs are a mix of hard and soft coral, each type of coral having its own indigenous marine plant life. Then, as a grand finale, we visit probably the most magnificent of the three reefs – the ‘Dzul-Ha Reef’. That means ‘Royal Water’ in the ancient Mayan language. This is just eight feet deep from the water surface to the sandy bottom, and so enjoys full sunlight and is a most impressive sight, even when viewed through the glass bottom of your boat. To relax on board between dives, with ample shade provided while you sip a cool soft drink, beer or water with our compliments, and excitedly swap experiences with your fellow divers. Then all too soon, it’s time to head back to port. Can we really have packed so much excitement and lifetime memories in less than three hours? What’s more because you enjoy direct contact with us, we can plan the very best tour for you (such as giving you a free upgrade to a private charter if your party is ten or more). What’s more, many of the items that other operators might charge you for – such as the one time only use snorkeling tube, the entry fee to the protected Marine Park and the beer, soft drinks and water are all included in your fee. As you now know, access to the fragile ecosystems that make up the protected Cozumel Marine Park is severely limited. But because of our high end glass-bottomed boats are so eco-friendly, we are allowed to operate 3 boats ONLY. However, despite being licensed to take 22 passengers, we restrict most parties to 12 so you enjoy maximum comfort and close personal attention at all times, particularly when snorkeling. And, because we are one of very few businesses able to provide the highest quality snorkeling experience and most of our clients come from the cruise ships, bringing in around 20,000 cruise visitors daily when we have a maximum capacity of just 36 seats - we tend to get booked up lightening fast for every day of the week, including Sundays. You can either stop to ‘think about it’ - only to come back later and be dismayed to see your choice of day has been taken. That means, if you only have that one particular day for your trip, you’ll either have to forgo the trip entirely or have to settle for a second rate trip which will NOT include snorkeling among the very best marine life rich reefs of the Paradise Reef, the Villablanca Gardens or the Dzul-Ha Reef. Instead, you will have to make do with the relatively barren reefs that most tour companies visit which were not considered spectacular enough to be part of the ecology-rich Marine Park that we are licensed to visit. What’s more, the general tourist area is not protected like the Marine Park, so there is a quite marked difference in the quality and quantity of the marine life. And the chances are high you will be crammed onto a boat (that might not even have a glass bottom) with 20 or more other folks, severely limiting your enjoyment and perhaps you’ll struggle to understand your guide’s broken English. 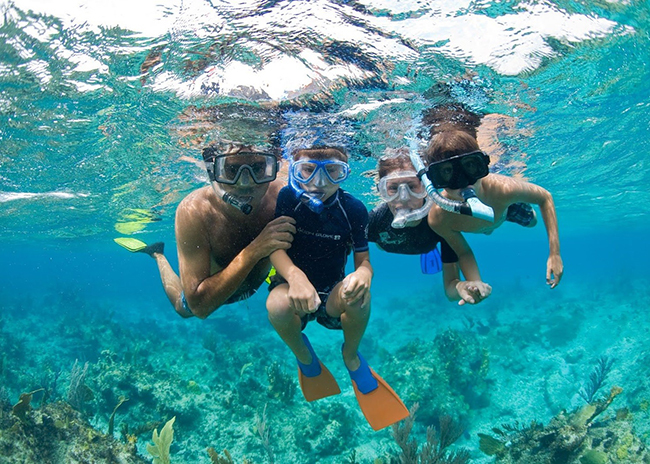 You can make the smart move and decide right now which day you want to become the memory of a lifetime by booking our premier Cozumel Snorkelling Tour that visits the awesome Cozumel Marine Park with all its glorious marine life. Once you’ve made your booking, you can relax and look forward to that magical moment when you step onto our boat. I and all my family are eagerly looking forward to welcoming you to Cozumel and showing you our wonderful Marine Park reefs first hand! Because of our small fleet of boats and our strict limit on passenger numbers, designed to give you the best possible personal experience, we often have difficulty coping with all the bookings coming from the 20,000 cruise passengers that arrive in Cozumel daily. So, now you know what a wonderland the Cozumel Marine Park is, I’d hate it if your hesitation in booking your tour with us condemned you to having to settle for a second best tour that does not take you into the protected, marine life rich Marine Park, but puts you – and up to 20 others - into the crowded poor quality reefs outside the park. So I strongly suggest you check the availability on your chosen day - RIGHT NOW – and then go ahead and book your seats before it's too late. 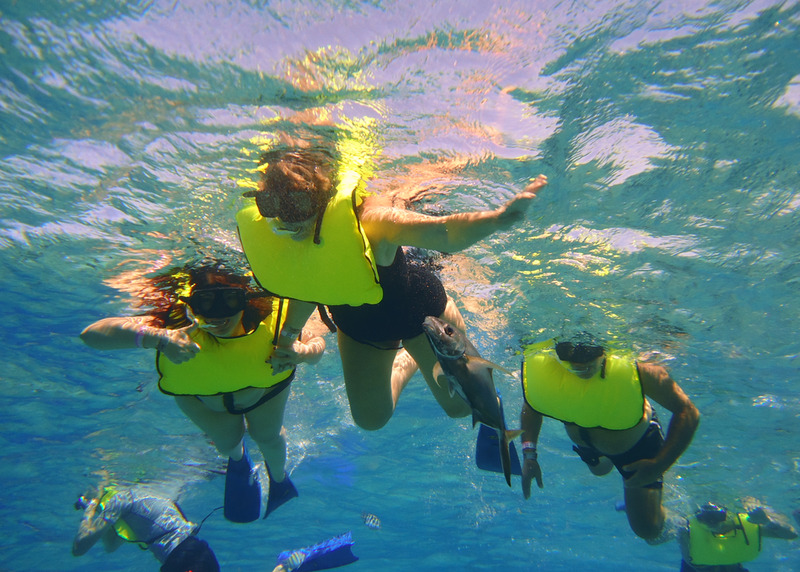 Excellent Tour for Cruisers like us"
We booked the Cozumel Snorkeling Tour for 2 people. Fernando met us on time and was a great host the entire day. During the boat ride to the first Reef, he shared tons of history and background of the area as well as the sad truth about the deterioration of the natural wildlife. There was one other couple on the trip, so it was a very small group. It was roughly 20 minutes to get to the first reef named Paradise Reef where we were provided with snorkel gear and a life jacket. The equipment was high quality and worked well. Do not apply sunscreen to your face before this trip, otherwise it will be difficult to create a good seal with the mask. After sharing some ground rules, Fernando led us into the water thru the boat's side ladder. It was an overcast day but visibility was still great. The Sea Creatures were Amazing, the Captain and the Guide were Awesome"
My boyfriend and I booked the snorkeling tour which includes 2 shallow reefs locations and a shallower one at a crystal clear site. For our tour, the guide offered us the option to substitute one of the locations with a shallow one that has sea turtles, so we went that route. Our guide was Fernando and our captain was Javier. They were amazing and perfect guides for our tour. They were extremely caring and went the extra mile to make sure we were comfortable, had everything we needed, and knew everything we needed to know before and during our tour. I would highly recommend Cozumel Snorkeling Tours. The sea creatures were amazing, the captain and guide were awesome, and the owner was extremely friendly. Whenever we go back to Cozumel, we will most likely do the same tour rather than trying a new place.